As one of the most universally popular breeds, Labrador Retrievers proudly wear a wide variety of names bearing many cultural influences. One favorite name theme among lab owners is coat color. Three major color varieties exist among the breed (black, yellow, and chocolate). Ace, Raven, and Dugan are common names for black labs. 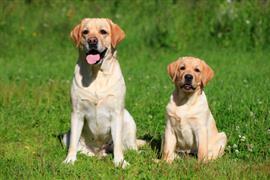 Yellow lab owners favor the names Golden, Honey, and Amber. The leading chocolate lab names are Coco, Bear, and Oreo. Known for their even temperament, the Labrador Retriever is as good with children as Saturday morning cartoons. A fun way to name your lab is to recall popular cartoon characters from your own childhood. Buster (from ‘Tiny Toon Adventures’), Teela (from ‘He-Man and the Masters of the Universe’), and Wade (from ‘Garfield and Friends’) are few cartoon inspired name options. Labs love the water and are in fact descendents of the Saint John’s Water Dog which was used by fisherman in Newfoundland to retrieve nets. Ernest, Zane, and McClane are potential names that are famous in fishing. Jack, Lenok, and Molly are few name ideas coming from actual fish. Some of our pages will contain a subcategory. A subcategory is a slightly more specific grouping than the main topic of the page. For a subcategory, we will include a separated table of names and corresponding descriptions. An example of a subcategory of Red Dog Names would be 'Dog Names Inspired by Red Wines'. If you have any subcategory ideas for the Labrador Retriever Names page, we would love to hear them. Use the form below to submit your ideas.